Here’s how to make mini cakes with homemade colored buttercream frosting. 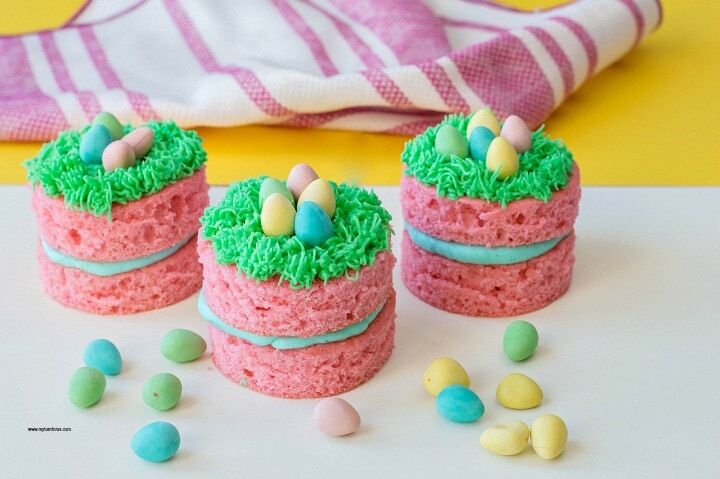 You can make six fun Easter Desserts with this mini cake recipe topped with mini layer cake decorations. Easter time is made up of bright, cheery colors don’t you agree? Whether we are making Easter cakes or bright little washcloth bunnies, it’s all the same with us; we also love the colors of spring. 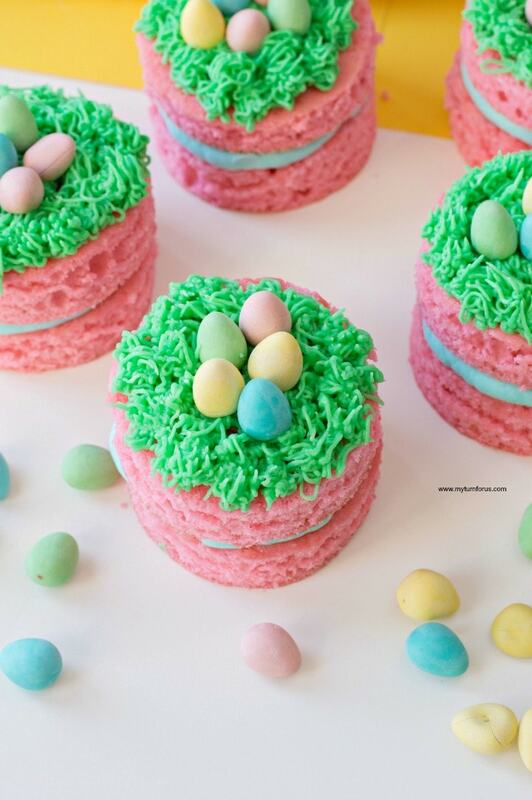 Last week we started looking around for fun Easter desserts that were very colorful. And we came up with a possible mini layer cake idea with a colored buttercream frosting. We wanted a mini cake recipe that was easy. And we came up with the idea of baking a sheet cake and cutting out little circles of mini cakes and stacking them. And it worked! Start by Preheating your oven to 350 degrees F. Line a baking sheet (about 13 x 9 in size) with parchment paper and set aside. Use a medium-sized mixing bowl and sift together flour, baking powder and salt and set aside. In a larger bowl beat eggs and sugar until creamy. Add vanilla extract and canola oil. Continue mixing. 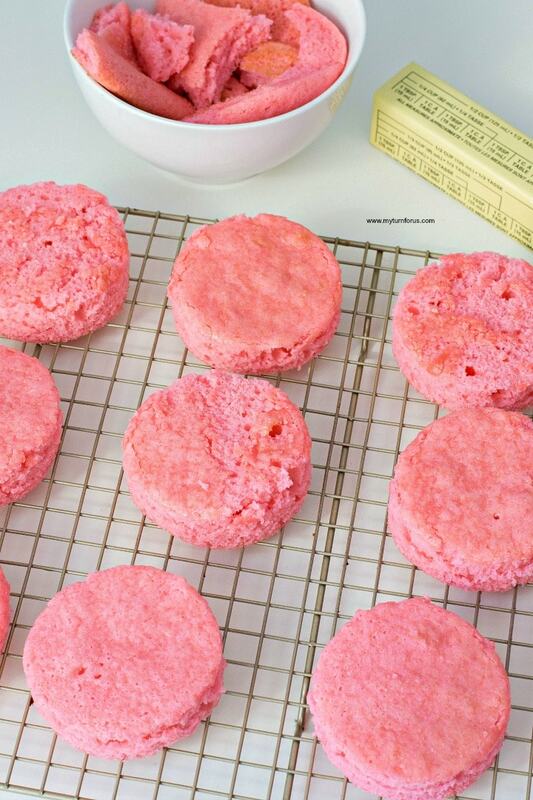 Alternate between adding dry ingredients and milk into your wet ingredients, ending with the dry ingredients.Add pink gel food coloring and beat until completely tinted. Spread cake batter onto lined baking sheet and spread evenly. Bake for approximately 15 minutes or until a toothpick comes out clean when inserted in the center of the cake. Allow the cakes to cool completely. 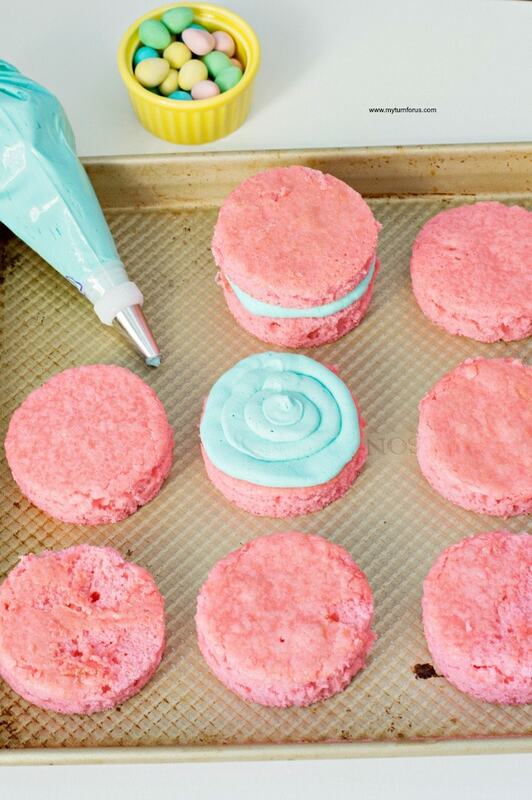 Use your cookie cutter to cut out 12 circles from your cake. The trims can be saved for a snack later or if you have little ones helping you, this will give them something to munch on as you assemble and decorate the mini cakes. Place your mini cake circles on a cooling rack and prepare the teal colored buttercream frosting tinting by using teal gel food coloring. Scoop the colored buttercream frosting into a piping bag with a round piping tip, Wilton #10. Frost 6 of your mini layer cakes. Create a mini layer cake by topping each with an unfrosted cake. 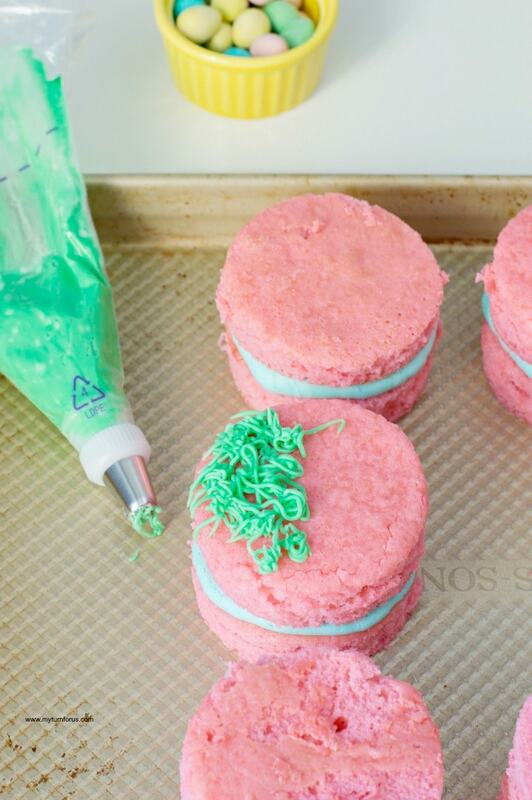 Make the green colored frosting with green gel food color. Scoop it into a piping bag with Wilton icing tip #233 attached. Frost the top of each mini layer cake with green buttercream making a faux grass. 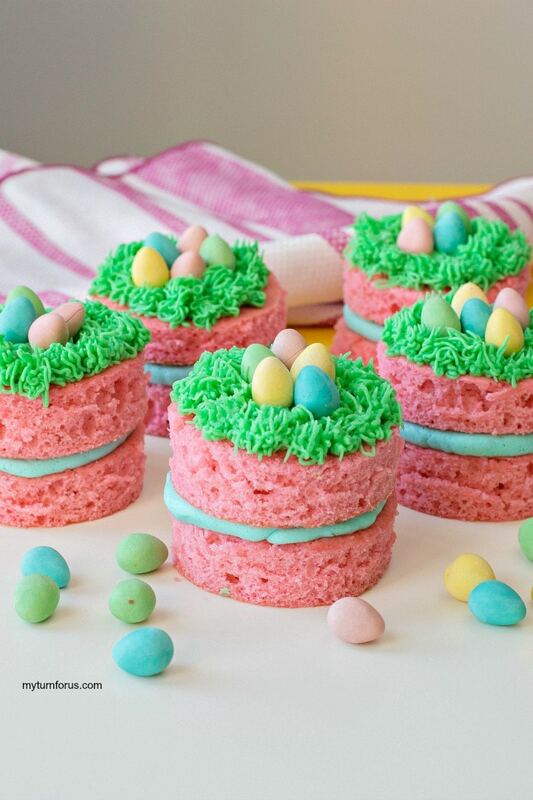 Add 4-5 candied eggs on top of each mini cake. Serve and enjoy! 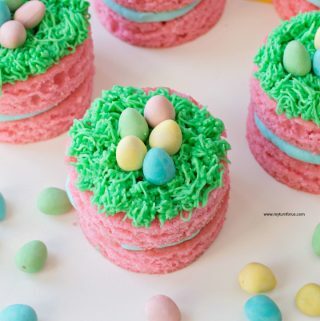 Don’t you just love jumping into springtime with loads of color with these fun Easter desserts using this mini cake recipe? Preheat oven to 350 degrees F. Line a baking sheet (about 13 x 9 in size) with a silicone baking mat and set aside. In a medium-sized bowl, sift together flour, baking powder, and salt. Spread cake batter onto a lined baking sheet - spread evenly. Bake for approximately 15 minutes or until a toothpick comes out clean when inserted in the center of the cake. Allow to cool. 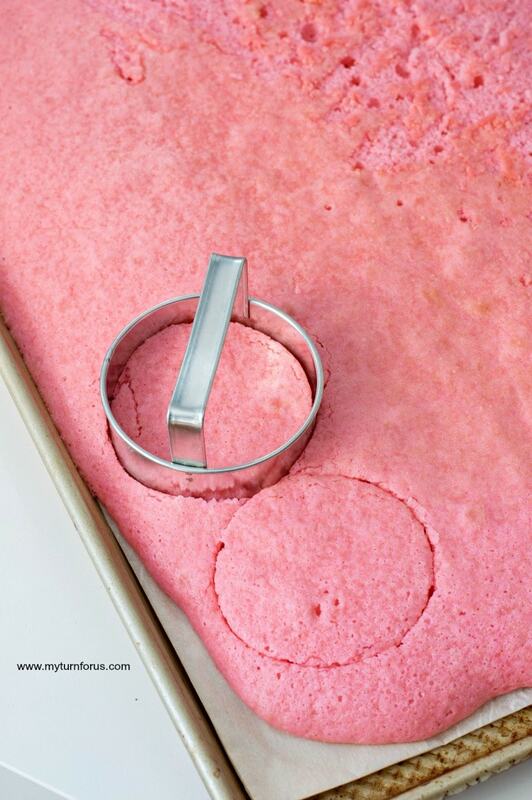 Use your cookie cutter to cut out 12 circles from your cake. Save the trims for later, as a snack! Make your teal buttercream by beating 1 stick of butter, 2 cups icing sugar and 2 tbsp milk with an electric mixer. 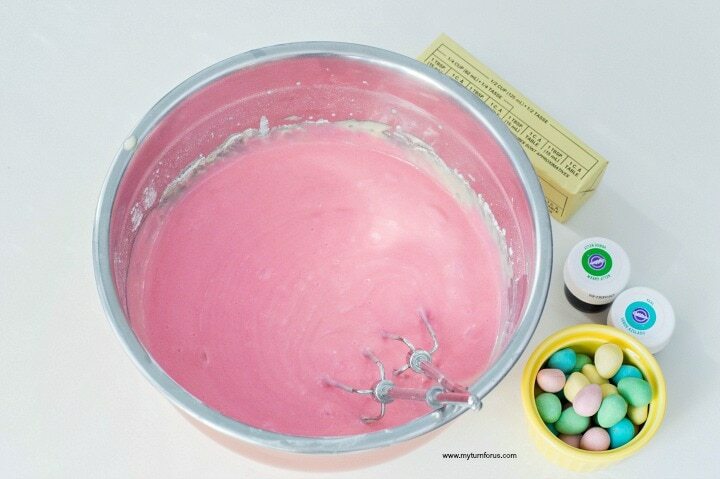 Once the buttercream is smooth, add teal gel food coloring and mix until completely tinted. Scoop teal buttercream into a piping bag with a round piping tip, Wilton #10. Frost 6 of your mini cakes. Top with an unfrosted cake. To make the green buttercream, beat ½ stick butter, 1 cup icing sugar, and 3 tbsp milk. Add green gel food coloring. Scoop green buttercream into a piping bag with Wilton icing tip #233 attached.